Jobs, prices, taxes and electricity are dominating political arguments in the lead up to presidential and parliamentary elections on 7 November. So, when the government said on 1 June that it was postponing announcements about next year's budget until after the polls, the opposition smelt a rat and the cedi fell 2% against the US dollar. At the heart of the fight are claims by the opposition New Patriotic Party (NPP) that the governing National Democratic Congress is trying to rig the economy as well as the vote. Although disputes over the credibility – and access to – the electoral register rumble on, the main battleground between the parties is now the state of the economy after eight years of NDC rule. Some NPP activists suspect that the government wants to delay the budget so it can boost spending massively to win over voters. After the elections, the NPP argues, the victors will be faced with a financial meltdown, with the economy mired in unsustainable debt and the state owing billions on contracts made with NDC crony capitalists and their foreign associates. Government officials downplay the budget delay, insisting that it's common practice before elections. Government projections for the economy, with rising oil and gas output and a reformed power sector, argue for a strong revival over the next four years. Bankers in Accra try to stay above the fray but are sceptical of both sides' campaign promises. The main point, one told Africa Confidential, is that more reliable and fact-checked information should be available to electors. That should include some details from both parties on spending plans for 2017. Another frustration expressed is over the lack of reliable information about the government's three most contentious contracts. These are the US$510 million contract with the Dubai-based Ameri Group to supply ten turbines at almost double the market price, which was meant to be evaluated by PricewaterhouseCoopers; the supply of two 220 megawatt power ships by Turkey's Karpower; and the $8 billion contract between Italy's ENI (Ente Nazionale Idrocarburi) and Netherlands-based Vitol to develop the Sankofa oil and gas fields, on terms one NDC insider described as 'ruinous' (AC Vol 57 No 5, It's the contract election & Vol 56 No 18, A helping hand from the Washington twins). Also receiving more scrutiny are the roles of the International Monetary Fund and World Bank as partisan debate about the economy intensifies. For example, the Bank's much-criticised private sector affiliate, the International Finance Corporation, fully endorsed the terms of the deal with ENI on Sankofa and the Bank raised a record $700 mn. in guarantees for the project: only one director on the Board questioned the terms and abstained from the vote. More widely, the IMF's endorsement of the government's economic management will help the NDC campaign. For 2016, the government says that its budget includes 825 mn. cedis ($214 mn. ), about 0.5% of gross domestic product, to organise the elections. Cost was one reason why the government-appointed Electoral Commission failed to produce a new electoral register to eliminate what the opposition claims are tens of thousands of bogus voters, mostly from neighbouring countries. As the 2012 presidential election was decided by fewer than 50,000 votes, it's a legitimate concern. In fact, state spending ballooned out of control before elections in both 2008, when the NPP was in power, and 2012, when the NDC was. This time, Ghana faces the toughest economic conditions for two decades and the government is dealing with strictures imposed by an IMF programme in exchange for a $900 mn. loan. it falls far below what Ghana needs to create jobs and modernise the economy. None of the other figures look much better. The budget deficit, at about 7% last year, is creeping downwards. Inflation was over 19% in March despite the Bank of Ghana setting interest rates at 26%. National debt is now slightly over 70% of GDP; that's the same level at which a decade ago, the previous government secured a deal under the World Bank's Heavily Indebted Poor Countries debt relief scheme. For now, the cedi exchange rate has stabilised, having lost about 50% of its value against the dollar between 2012 and the end of 2015. An IMF team visiting Accra last month said cautiously that the government's implementation of the programme was 'broadly satisfactory', apart from missing some targets on the wage bill and central bank management. Outstanding priorities included finalising delayed reforms to public finance and the Bank of Ghana, and dealing with cash-strapped state companies in the energy sector. Much depends on the Fund's verdict that its directors are due to discuss in Washington in a few weeks' time. An IMF imprimatur offers the government backing as it tries either to float another Eurobond or to raise a syndicated bank loan. Britain's Standard Chartered and the Bank of America are advising the government on the Eurobond issue, which aims to raise about $750 mn. to make up a shortfall in this year's budget and a further $250 mn. to repay current obligations. Big questions remain about the government's finance strategy as interest rates and debt service escalate. It plans to sell another $2 billion of bonds to refinance state power companies. To pay for that, it plans to add another 10% charge to electricity tariffs and a surcharge on fuel, raising prices sharply ahead of the elections. Irrepressibly bullish Finance Minister Terkper has been running a roadshow for investors under the hopeful title of 'Ghana's Turnaround Story' and proclaiming a 'firm commitment to fiscal consolidation' and 'sound debt management'. In his version, the weak economy was caused not by bad policy, mismanagement and rent-seeking but simply by commodity price crashes. The 2015 budget was premised on a price of $99 for each barrel of oil that Ghana exported (though this year, the government wants to cut that to $35-40 a barrel) and a fall in the gold price from about $1,800 an ounce in 2012 to about $1,000/oz. at the start of this year. Yet the market doesn't buy the Turnaround story. The costs of floating a $1bn. bond in the near future look prohibitively expensive for the country. Even without new borrowing, Ghana will pay about $1.2 bn. in debt service costs as foreign debt balloons to about $22 bn., double the level of five years ago. In January, the IMF set out fresh debt limits – $1bn for a Eurobond and other non-concessional borrowing, and up to $150 mn. for a semi-concessional loan from the World Bank. 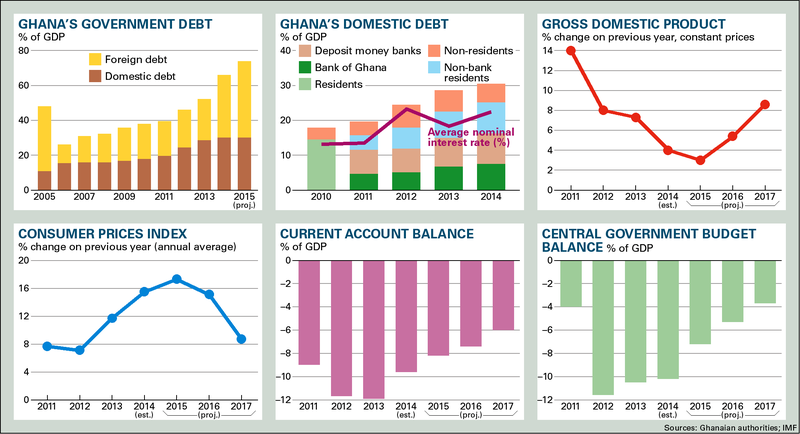 'Ghana's risk of debt distress remains high,' it warned. More warnings came in a World Bank report pointing out that inequalities were growing sharply between the southern rainforest regions and the northern savannah, President John Dramani Mahama's base. It blames this on higher levels of subsistence farming and slower urbanisation. It doesn't explain why government efforts to finance northern development projects have run aground. How might economic conditions influence election results this year? Both Mahama and Mahamudu Bawumia, the running mate of the NPP flag-bearer, Nana Akufo-Addo, hail from the north and are campaigning hard. The NDC has traditionally polled far ahead of the NPP in the north, relying on a well established network of local chieftains and activists, although this year, the NPP has been pressing harder there. Although dissatisfaction has risen sharply in cities such as Accra, Kumasi and Takoradi since the 2012 elections and will boost the NPP, it's less clear how the economic slowdown will affect votes in the hinterland. Pride of place in the NDC campaign is its 'Green Book', an exhaustive list of government-built roads, water systems, clinics and schools (AC Vol 57 No 5, A disputed state of the nation). That is meant to explain the current economic problems in terms of the party's longer-term plans. Although not many seem convinced by such arguments, new roads and clinics will doubtless win votes. Against that, the NPP's Akufo-Addo campaigns against the government's management record, describing it as 'clueless' and profligate. Trickier to sell is the NPP's campaign for modernisation and industrialisation: the risk is that it can sound like an academic seminar to many electors who are more focused on the present. Akufo-Addo's call for universal free secondary education seemed to have greater resonance in the 2012 elections. Also important will be the relative financial power of the campaigns: no one doubts that the NDC has a bigger war chest than the NPP and more backing from the state media. Akufo and Bawumia are trying to counter those disadvantages by relentless tours of the regions, addressing hundreds of village and town hall meetings. Some local economic issues could resonate more widely, such as the fight over the future of AngloGold Ashanti's mines at Obuasi. South African-based AngloGold filed a complaint against Ghana at the World Bank's International Centre for Settlement of Investment Disputes in Washington, United States, accusing the government of failing to restore order after the Obuasi mine was occupied by galamsey (artisanal) miners. AngloGold stopped production at Obuasi in 2014 and sacked most of the workers, claiming the mine was no longer viable but that it would bring in a new investor to redevelop it. One of Africa's richest mines with over 5 mn. oz. of high quality gold, Obuasi has great resonance in Ghana among the country's biggest ethnic group, the Ashanti. Accordingly, the NDC has been working hard to win Ashanti support. Until now, most Ashanti votes have gone to the NPP, which evokes the tradition of two historically important politicians, J.B. Danquah, who was Akyem like Akufo-Addo, and Kofi Abrefa Busia, an Ashanti prince. President Mahama's brother Ibrahim Mahama has a strong business relationship with the Ashanti (or Asante) king, the Asantehene, who has been tilting towards the NDC even if ostensibly he has to stay neutral. Ibrahim Mahama has been active behind the scenes in the Obuasi mine dispute, attracting criticism from figures such as Sam Jonah, who was born in Obuasi and is a former President of AngloGold Ashanti (AC Vol 43 No 15, I'm Sam, fly me). Views differ over whether the occupation of the mine will force concessions from AngloGold or just a looting expedition by local miners on behalf of some wealthy patrons. More chaos at the mine could cost the government political support but it would gain if it could force AngloGold to sell to a company willing to reopen it. AngloGold says it has a commitment from South Africa's Randgold to modernise Obuasi but detailed plans are yet to emerge as the temperature of the dispute rises. Another economic row has blown up over the government abandoning its plans to sell the Agricultural Development Bank, due to have been one of the continent's biggest sales of state assets. Wracked by legal and government disputes, the initial public offering for the ADB, which had raised over 430 mn. cedis ($115 mn. ), was cancelled by the state regulator. After investors from private companies such as the international, Togolese-based Ecobank and Ghana's Databank had their money returned, there has been talk of the state-owned Social Security and National Insurance Trust, encouraged by NDC politicians and business allies, taking a large stake in the ADB instead. The hoped-for boost to Ghana's capital markets may not happen now. Prepared for Free Article on 23/04/2019 at 17:15. Authorized users may download, save, and print articles for their own use, but may not further disseminate these articles in their electronic form without express written permission from Africa Confidential / Asempa Limited. Contact subscriptions@africa-confidential.com.